For Anton Gunn, the journey to become a successful health care advocate began with a deeply personal experience. “It hit me to the core,” Gunn, the Director External Affairs for the U.S. Department of Health and Human Services, said in an interview with BlackAmericaWeb.com. Ten years ago, Gunn was 30 years old and recently married. He learned that his wife was pregnant with their daughter and he was bursting with excitement until Gunn received some disturbing news from his doctor. Gunn, a former South Carolina legislator, was outraged and confused. “This made no sense to me,” he said, exasperated. “I had two degrees, a job with health benefits, I was working in health care policy, and I thought if this was happening to me, then what was happening to the rest of America? Gunn, who brings passion and a sense of urgency to his profession, feels he was destined to work in the health care field because he started his career working as a community organizer helping low-income children find adequate health care. “It hit me that so many children in America didn’t have didn’t have health insurance,” Gunn said. “I would hear these stories about children in rural South Carolina who were failing in school not because they weren’t smart but because they didn’t have health coverage or dental coverage so they had teeth rotting in their mouths,” he said. Today, Gunn, a highly-visible aide for the Obama administration who has been working as a health care advocate for 17 years, is a point person for the Affordable Care Act who provides outreach to the African American community. Gunn, who works closely with Kathleen Sebelius, Secretary of the U.S. Department of Health and Human Services, spends a good part of his time talking to black America about the president’s Affordable Care Act through black radio, which includes conversations with radio hosts Tom Joyner, Joe Madison and Russ Parr, among others. 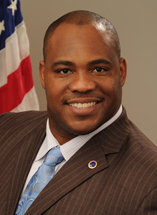 For African Americans, Gunn said, the Affordable Care Act ensures that people cannot be denied health coverage because of pre-existing conditions. Gunn’s national outreach campaign comes as a new report released by the Department of Health and Human Services shows that six out of ten (4.2 million) uninsured African Americans who may be eligible for coverage through the Health Insurance Marketplace might qualify for Medicaid, the Children’s Health Insurance Program (CHIP), or tax credits to help with the cost of premiums. If all states took advantage of new opportunities to expand Medicaid coverage under the Affordable Care Act, Gunn said, 95 percent of uninsured African Americans who may be eligible for the Marketplace might qualify for Medicaid, the Children’s Health Insurance Program (CHIP), or tax credits to help with the cost of premiums. The report also details uninsurance rates by state and provides several examples of what premiums might look like for African Americans living in major metropolitan areas. One fifth of uninsured African American citizens and permanent residents live the greater Atlanta, New York, Chicago, Dallas, Houston, and Detroit metropolitan areas. A 27-year-old in Atlanta with an income of $25,000 can pay as little as $105 a month for a bronze plan after applying the tax credit, while a family of four with an income of $50,000 could pay $148 a month for a bronze plan after applying the tax credit. Nationwide, about 2 million uninsured African Americans may be eligible for coverage through Medicaid or the Children’s Health Insurance Program (CHIP). Meanwhile, Gunn said the Affordable Care Act’s website is up and running and Americans can enroll online, or through a 24-hour call center — 800 318 2596 – or enroll in-person through community health centers across the country. Under the Affordable Care Act, Gunn said, black women can now get counseling, breast-feeding support, mammograms, cervix cancer screenings and pre-natal care. Gunn said there are plenty of African Americans who dream of starting their own businesses and becoming entrepreneurs, but can’t because they need to keep their full-time jobs because somebody in their family needs health insurance. “But now, because of the Affordable Care Act, people do not have to be locked into their jobs and more people in our communities can become entrepreneurs because the can buy low-cost insurance through the Affordable Care Act,” he said. Gunn said Obama’s health care initiative is a game-changer for the African American community. • 7.3 million African Americans with private insurance now have access to expanded preventive services with no cost sharing. This includes services such as colonoscopy screening for colon cancer, Pap smears and mammograms for women, well-child visits, and flu shots for all children and adults. • An estimated 5.1 million African American women with private health insurance now have guaranteed access to women’s preventive services without cost sharing. These services include well-woman visits, HPV testing, counseling services, breastfeeding support, mammograms and screenings for cervical cancer, prenatal care, and other services. • The 4.5 million elderly and disabled African Americans who receive health coverage from Medicare also have access to many preventive services with no cost-sharing, including annual wellness visits with personalized prevention plans, diabetes and colorectal cancer screening, bone mass measurement and mammograms. • More than 500,000 young African American adults between ages 19 and 25 who would otherwise have been uninsured, including 230,000 African American women, now have coverage under their parents employer-sponsored or individually purchased health plan. “The Affordable Care Act will change the future of our community because if you are not healthy in your mind and not healthy in your body how much can you really contribute to your family and your community?” Gunn asked.